The M50 impresses with its choice of components, but is let down by poor screen and build quality. A significant chunk of the laptop market is still taken up by traditional notebooks that trounce Ultrabooks with larger screens, more versatile specifications and lower prices than many of Intel's hyped-up machines can currently match. The Satellite M50-A-11C is the latest such system to arrive on the TechRadar testing bench, and Toshiba reckons it's got the sort of specification that will make slimmer laptops envious. Power comes from a combination of a current-generation Intel Core i5 processor and discrete Nvidia graphics core, and those headline components are backed up by a decent specification elsewhere – plenty of RAM, a large hard disk and good connectivity. Toshiba isn't usually a firm that takes risks with the physical design of its laptops, and that's certainly the case here. The Satellite M50 is a good-looking machine, but there's little new about the layer of brushed aluminium that's used to coat much of this machine, or the glossy black bezel that surrounds the 15.6in screen – and the panel's resolution of 1,366 x 768 isn't exactly going to set pulses racing, either. This versatile mid-range machine has plenty of competition. The home-grown Toshiba Satellite U50t represents the new breed of Intel laptops: it's got an Ultrabook sticker on its wrist-rest, which means it's lighter than the M50 – and, at £630, it's barely any more expensive than this machine. Samsung's Ativ Book 9 Lite also takes aim from the slimmer end of the market. It's an ultraportable designed along the same sleek lines as Samsung's more expensive laptops, and it's got a touchscreen alongside AMD hardware. Crucially, it costs just £499. Competition also comes from the Asus Aspire V5, which is a Windows 8.1 touchscreen machine that's smaller and lighter than the Toshiba M50, and the Lenovo G505s – a £500 system with a chunky design and a 15.6in screen that aims to satisfy the mid-range market before the M50 can get its chance. Processing power in this machine comes from a Core i5-4200U. It's a part hewn from Intel's latest Haswell architecture, and this 22nm chip has a respectable specification that includes a 1.6GHz standard clock, a Turbo Boost peak of 2.6GHz, and two Hyper-Threaded cores. It's the same processor as in the Toshiba Satellite U50t, and a better-sounding proposition than the low-power AMD A6 parts inside the Samsung and Asus laptops – although it may face a stiffer test when up against the Lenovo's beefy AMD A10 APU. The graphics core, like the processor, is a current-generation part – at least in name, if not in architecture. Nvidia's GeForce GT 740M uses the GK107 core that did the rounds in last year's range of 600-Series mobile GPUs, and here it has 384 stream processors clocked to 810MHz alongside 2GB of dedicated GDDR5 memory. It sounds more powerful than the integrated Intel and Radeon chips inside three of its rivals, although the Lenovo's AMD A10 graphics might give the GeForce silicon a scare. Elsewhere, there's 6GB of DDR3 memory and a 750GB hard disk. That's plenty of storage capacity, but we're not exactly expecting great speed from that drive – it spins at just 5,400rpm. If you're after pace, the Samsung has an SSD, although its capacity is restricted to just 120GB. Connectivity includes dual-band 802.11n Wi-Fi, Gigabit Ethernet and Bluetooth 4.0. The Ethernet port sits on the right-hand edge along with two USB 3 connections and an HDMI output, and the Toshiba's left-hand side houses a USB 2 connection, audio jack and SD card reader. It's an acceptable port selection, although Toshiba has omitted a VGA output. There's no room for a DVD writer either – a disappointing omission that, at least, brings the M50 in line with Ultrabooks. The M50's chassis is made largely from plastic, with a thin layer of brushed aluminium used to add a touch of class to the lid and the interior. It's a smart-looking machine that does nothing new in terms of physical design. We found it nearly impossible to get inside, too – there's no smaller panel to provide access to the memory slots and hard disk, and we couldn't budge the base even once we'd removed a multitude of screws. 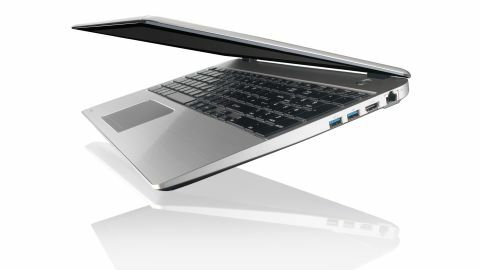 The Toshiba is no Ultrabook, which becomes obvious when its frame hits the scales: the M50's 2.2kg weight is heavier than the other Toshiba machine as well as the M50's rivals from Samsung and Acer – only the 2.4kg Lenovo G505s is heftier. The M50's 22mm thickness is more impressive. That's almost two millimetres inside Intel's official specification for larger Ultrabooks, and it matches Toshiba's own Satellite U50t. It's also much slimmer than the 29mm-thick Lenovo. The heavy weight and thin design contributed to middling build quality. The wrist-rest is strong, but the screen flexed back and forward – and the base panel is made from flimsy plastic with plenty of give when it's prodded. We'd protect the M50 in a sleeve before slinging it in a bag.